Arsenal are in rich vain of form at the moment as they have kind of consolidated their position in the premier league top 3, currently leading Manchester United by 1 point and Liverpool by 3 with only 10 more matches to be played but they are long way away from title race and already lost against Monaco in the first leg of champions league sitting on the verge of elimination which leaves them with only one chance of silverware this season in FA Cup 2015. Arsene Wenger side are defending champions having won the cup last year which was their first trophy since 2005 FA Cup sucess, now they will be up against Manchester United in the quarter final game to be played this Monday night at Old Trafford which is setting up to be a proper heavyweight clash. Louis Van Gaal has done a decent job so far, nothing spectacular but pure business as far as top 4 position is concerned but he has been taking FA Cup very seriously which is their only chance of silverware this season. United are coming into the quarter final game on the back of lucky but massive three points against Newcastle United and we can expect some changes from the starting lineup against Arsenal. Arsene Wenger side recorded another 2-1 win over QPR in the midweek but that came at price with Gabriel Paulista getting injured in first half and set to miss United clash. Which means Laurent Koscielny is likely to start alongside Per Mertesacker in central defense while Arsenal were boosted by return of Aron Ramsey as he made a second half appearance for Arsenal, only injury worry is of Jack Wilshere but he might be fit enough to take a place on bench. Manchester United started with Rooney as a lone striker upfront while Rademal Falcao was benched against Newacastle United but I expect him to start against Arsenal and Rooney might drop into the midfield along with Michael Carrick who return from recent injury and got a few minutes under his belt in midweek. Di Maria has been poor in last couple of months and we might see either Juan Mata or Adnan Januzaj started and Di Maria settling for a place on the bench. The confirm lineups will be announced 1 hour head of the game and we will update it right here. 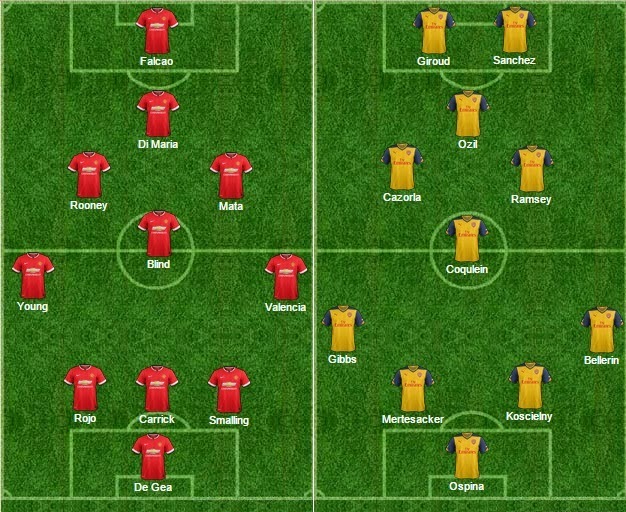 below is the expected lineups of both sides going into the quarter final tie. United beat Arsenal at Emirates earlier in the season but this is a different Arsenal at its vintage best, they have not only overtaken United in Premier League but they are getting result even without playing superb football. 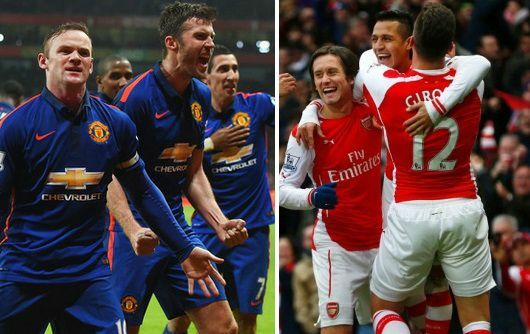 But over the last few years United have been so dominant against Arsenal that its getting embarrassing. United are likely to start with Rademal Falcao who will be eager to get a goal or two and if there is a team against which he can come good its Arsenal, United results has been called lucky at times but its 28 games into premier league season but only luck won’t keep them in top 4 and thats where they are at the moment. They are struggling to score goals but have become much better defensive unit and Arsenal will find it hard to break the defense at Old Trafford, I am going with another United win here I think the stars they have in the team they are likely to come good at some stage and against Arsenal FA Cup quarter final its a perfect Opportunity. A 2-1 win for United maybe ? Let me know your thoughts in the comments section below.